Jesse Stiff and his family came to this area in 1835 making them some of the earliest settlers in the county. This was ten years before Texas became a state. He fought in the Mexican War in 1846. A section of the Constitution of the Republic of Texas in 1836 provided that all heads of families living in Texas at the time of the Declaration of Independence (March 2, 1836) were entitled to one league and one labor of land (4605.5 acres). Jesse Stiff claimed his one league and one labor about seven miles northeast of McKinney. The creek going through his land was called Stiff Creek. A small community grew in this area called Stiff Chapel. In 1856 land was donated for a school. Wallis Chapel Christian Church was on a hill nearby. This cemetery is 2 acres surrounded by a 6-foot chain-link fence. The first grave in the cemetery was for James Stiff, a Texas Ranger, who was a son of Jesse Stiff. He came home sick and died on September 10, 1847. This makes the cemetery one of the oldest ones in the county. The cemetery is in fairly good condition. The western side of the cemetery is grass while the eastern side has heavy trees. The fence could use a little work and the trees could be trimmed. The grass has not been cut this year but it had been cut the previous year. Several of the stones could be repaired. Some of the early stones came from the rock quarry near Farmersville. 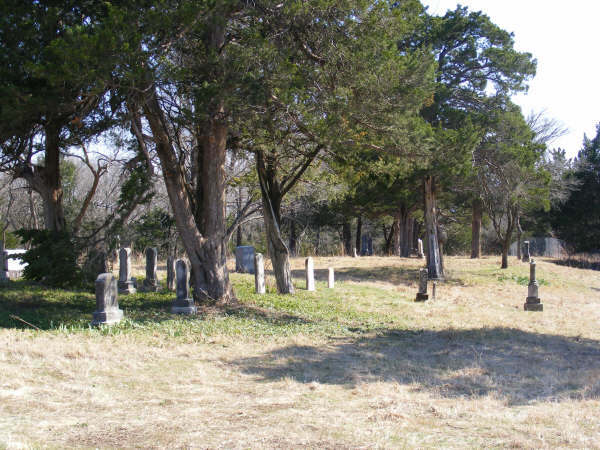 According to COLLIN COUNTY CEMETERY INSCRIPTIONS I, there are 100 graves here. About ½ that amount are evident. There is a row of old stones for the Stiff family that have been laid flat and set in concrete. The deed for the cemetery is listed in Vol. 55, p 625. MINNIE SWAIM, TOOK PLACE IN 1935. Cemetery Working to be held Saturday May 16, 1914. Uncle Henry Stiff was here today from his home at Stiff Chapel, seven miles northwest [northeast] of McKinney, visiting at the home of his son-in-law, W. L. Braswell on North Tennessee Street. As previously mentioned in these columns those interested will meet to clean off the Stiff Chapel old graveyard Saturday, May 16. Everyone is invited to take along his spade, hoe, rake and axe and also your dinner basket. Uncle Henry Stiff will be 81 years old on the 17th of next November. He came to that community in 1849. When he settled there, only two graves were contained in the Stiff Chapel graveyard, which is one of the oldest burying grounds in the county. A little child of Jordan O. Straughan was the first to be buried in it. Jim Stiff, son of the late Jesse Stiff, was the second to be buried there. Thus the Stiff Chapel graveyard had its beginning prior to the year of 1849 more than 65 years ago. Uncle Jesse Stiff donated the land for the graveyard. In its quiet precincts sleeps the dust of many of our county's most honored and best known early pioneers. The Stiff Chapel graveyard is one of the oldest present burying grounds in the entire county. It gets its name from Jess Stiff, who headrighted a large body of land on which the cemetery is located. Jesse Stiff came to Collin county about 1834 or 1835. He settled on the slight hill or prominence on which the cemetery is located. His old pioneer log cabin, vacant and falling in ruins before the relentless tooth of time still stands hard by--a mute reminder of the pioneer period of our present thickly populated county. 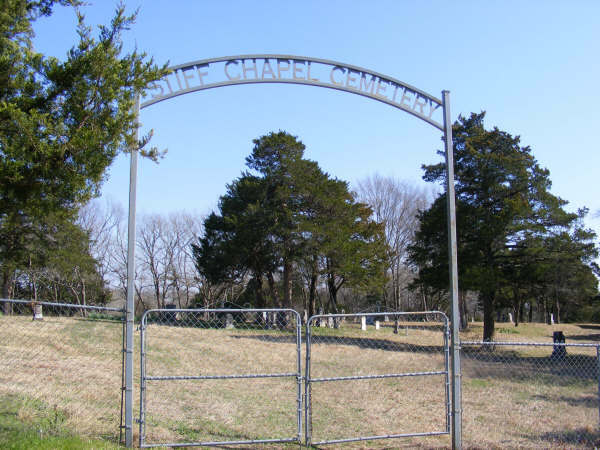 The first person to be buried in the Stiff Chapel graveyard was James Stiff, son of Jesse Stiff and a Texas ranger who came home sick and died. In keeping with the best tombstones that were available at that comparatively wild and uncivilized period of our county's development, native stone slabs were hauled from a quarry near where Farmersville now stands, and a crude sarcophagus was erected over the grave and the following inscription chiseled on the flat slab covering: "Sacred to the memory of James Stiff, son of Jesse and Mary Stiff. Born Oct. 11, 1829. Died Sept, 10, 1847." Thus the first interment took place 70 years ago in the coming September.